Winds of war in the Middle East rush after the break of diplomatic relations between Iran and Saudi Arabia. On Jan 2, 105, the Saudi court has carried out the the death sentence of the Shiite cleric, Sheikh Nimr al Nimr, and this has triggered dangerous manifestations cracking already historically complicated relations between the two countries. Nimr al Nimr was one of the promoters of the Shiite minority protests in Saudi Arabia during the riots of the "Arab Spring", between 2011 and 2012. The Saudi Arabia is at Sunni majority, but the Shiite minority, which occupies the eastern part of the country, has often protested against the government because of Ryad persecuted. 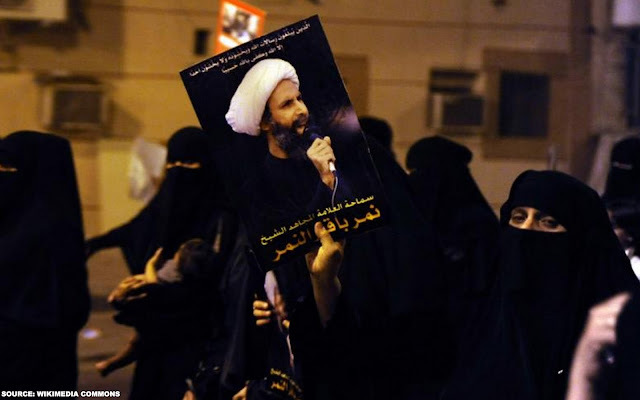 In 2012, during an event, al Nimr was wounded in gunfire with police and subsequently arrested. Last October, a Saudi court sentenced al Nimr to death, accusing him of having favored the Persian interests in the Saudi Arabia. The Islamic Republic is at majority Shiite, a religious difference that puts Iran in contrast to the Saudi Arabia. A division that has deep roots dating back to 632 A.C., the year of death of the Prophet Muhammad, founder of Islam, when they had to decide who to entrust the succession.On one hand, the first group argued that the friend and father of the wife of Muhammad, Abu Bakr, were to inherit the political and religious heritage of the Prophet. On the other hand, a minority faction believed that the successor should be a relative of Mohammed, in particular, the cousin and son, Ali. According to the rules of tribal tradition, the majority group commissioned the assembly of wise men - who appointed Abu Bakr - to elect the "first Caliph" (Khalifah). The second minority group considered illegitimate the election and, especially, considered Abu-Bakr a usurper of Ali's right to succeed Muhammad. Supporters of newly elected caliph were the Sunnis, who took their name from the Sunna, the tradition of the Prophet, the second source of Islamic law after the Koran. Opponents, Shiites - from sci'a term meaning "faction" - began to identify themselves as "party of Ali", Shi'atul Ali that became the fourth Caliph, suspected of complicity in the killing of his predecessor. The contrast between the two types of Islam became even more heated in 680 A.C., when Hussein - the son of Ali - was killed in Karbala, city of Iraq, at the hands of the Caliph Yazid of the Umayyad dynasty, an offense that has shouted revenge for a long time. Karbala has become the holy city for Shiites, Mecca for Sunnis; although, it was binding the Shiites have to go to Mecca for the pilgrimage, one of the foundations of Islam. There are five pillars of Islam: Allah, the ritual prayers, alms, fasting during Ramadan and the pilgrimage to Mecca at least once in life. The main difference between the majority and the minority of Islam regards the religious hierarchy, the authority exercising the power to settle disputes and to fix the religious practice, which joins the faithful. According to Sunni Islam, the Caliph is the successor of the Prophet, leader and defender of the Islamic community. Guardian of the Shari'ah, the Caliph administers Islamic law and exercises the role of judge. According to the Shiites, however, the heir of the Prophet and leader of the community is the Imam. Unlike their ancestors, descendants of Ali, the twelfth and final Imam descended from Muhammad and is still hidden, but one day it will manifest to fulfill the will of Allah. Former Iranian President Ahmadineajd, Shiite, during meetings of government reserved a place in the Mahdi (literally, "well-guided by God") waiting for his coming, and erected a platform for the landing of the helicopter of Imam. Based on these initial inconsistencies, the Sunnis have accused Shi'ites of heresy; mind the Shiites have accused the Sunni responsibility for having contributed to the proliferation of extremist sects. Subsequently, it is the policy that has fueled the rift between Shiites and Sunnis. This rivalry worsens at the political level during the Khomeini revolution in Iran in 1979. A historic event that brought about the fall of the Shah Reza Pahlavi and the establishment of an Islamic theocracy, Shiite versus Sunni regimes of the Persian Gulf. From 1979 onwards, the alliances on the Middle East scenario change and reinforce the crescent conflict between Sunnis and the Shiite, which includes Iran and the growing influence of Hezbollah in Lebanon via Alawite Syria and Iraq. A division that still marks the reality of the Islamic world and weighs on sides of the Sunni powers like Saudi Arabia and Turkey, and Shiite, like Iran and Iraq, whereas the member in charge of the two sides of Islam since 1979, the 'Sunni Saudi Arabia and Shi'ite Iran are among the key players in the Syrian War and the conflict in Yemen. Today, this rivalry opens a direct clash between the two religious and political opponents, and if the Iranian Supreme Leader Ali Khamenei has called a "divine vengeance" against the Saudi Arabia and Ryad has raised accusing Tehran of being "sponsors of terror", the tension climbs as the risk of an escalation of violence that could destabilize the precarious balance in the Middle East.